Chelsea kept the pressure on Arsenal and Manchester United at the top of the table with victory over Tottenham. 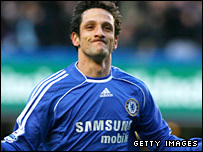 Juliano Belletti's powerful 25-yard strike put Chelsea ahead after Spurs left him with room to shoot at goal. Tottenham struggled to create clear chances, with Steed Malbranque going closest with a well-struck volley. 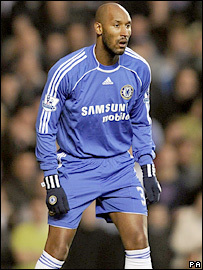 Nicolas Anelka hit the bar after making his Chelsea debut off the bench and Shaun Wright-Phillips sealed the win with a low shot past Radek Cerny. Chelsea's victory maintained their long-standing dominance over their London rivals at Stamford Bridge, with Spurs' last away win over the Blues coming back in 1990. The opening stages were fiercely contested, but lacking in quality with the emphasis on perspiration rather than inspiration. If Chelsea can just keep grinding out wins until the big boys are fit and back from the African Nations Cup, we may still have a part to play in the title race. But the match suddenly exploded into life with a superb strike from Belletti, and Spurs had no-one to blame but themselves. A scruffy Chelsea corner came all the way out to Ashley Cole just inside the Spurs half, and he squared the ball to Belletti who was given the freedom to amble forward, have two touches and pick his spot in the top corner. Soon after, Spurs midfielder Kevin-Prince Boateng briefly forgot what sport he was playing as he hauled Joe Cole down on halfway with a rugby tackle that Jonny Wilkinson would have been proud of, and the German was lucky to escape with a booking. Some genuine quality from Spurs almost led to the equaliser after Aaron Lennon, sprinting into acres of space with Ashley Cole nowhere to be seen, picked out the unmarked Malbranque at the back post, but his first-time volley was well saved by Petr Cech. Spurs were seeing more of the ball and went close through Boateng, but a promising position was wasted by a dreadful free-kick from Jamie O'Hara which went out on the full. Chelsea did get the ball in the net for a second time shortly before half-time, but Michael Ballack was so far offside from Florent Malouda's pass that he barely even bothered celebrating. After the break, it was more of the same as both sides struggled to carve open clear cut opportunities and the main excitement came from watching the red mist descend on Malbranque. The Frenchman was booked for a needless foul on Shaun Wright-Phillips and then hauled down Malouda moments later, shortly before being taken off by a sensible Juande Ramos. Anelka's introduction for the severely disappointing Claudio Pizarro gave the game a much-needed lift and the £15m striker almost made an instant impression. A skilful back-heel from Wright-Phillips found its way to Anelka inside the box, and he controlled it and shot on the turn only to be denied by a top-notch save from Cerny, who was again preferred to Paul Robinson between the posts. Spurs raised their game and started to play some nice stuff around the box, but there was little real danger for Cech to deal with. Wright-Phillips made the game safe for Chelsea with a powerful shot from the edge of the box after some fine work from Joe Cole, who looked sharp throughout. And there was almost a fairytale finish for Anelka as he latched onto a loose ball in the box, but his shot smacked the underside of the bar and bounced away to safety. "When he came on he hit the post and forced the keeper to make a very good save. "Normally he would not have played in this game because he did not train with us but we do not have strikers. "So we put him on the bench and he is such an intelligent player that he knows how we play and how to fit in." "It was a poor game and it was tight with not many chances. "Chelsea controlled the game and they are a team that even if they are not playing well will find a way to score and get the points. "There were some positives in that our young midfield players did well and they competed. "It is good experience for them to play here against big international players." Chelsea: Cech, Belletti, Carvalho, Alex, Ashley Cole, Malouda (Bridge 84), Makelele, Ballack, Wright-Phillips (Sidwell 90), Pizarro (Anelka 58), Joe Cole. Subs Not Used: Cudicini, Ben-Haim. Goals: Belletti 19, Wright-Phillips 80. Tottenham: Cerny, Chimbonda, Dawson, King, Lee, Lennon, O'Hara (Defoe 77), Boateng (Kaboul 84), Malbranque (Taarabt 59), Keane, Berbatov. Subs Not Used: Robinson, Gunter. Booked: Boateng, Malbranque, O'Hara, Lennon. BBC Sport Player Rater man of the match: Chelsea's Shaun Wright-Phillips 7.54 (on 90 minutes).